We quit our jobs to visit all 59 US national parks in one year. Now we're back in STL, but we're forever exploring our beautiful country. Pure solitude: there is no other way to describe our time here. We encountered maybe a handful of other hikers in three days around the Port Alsworth area of Lake Clark National Park. And it was amazing! Because we didn’t want to take the one-day fly-in bear viewing trip here, we coordinated a series of regularly-scheduled bush plane flights with Lake & Pen Air to get the cheapest flights to and from Port Alsworth. 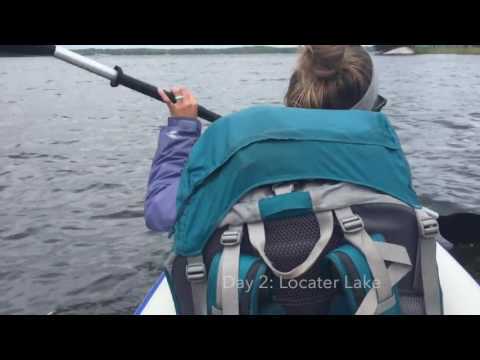 After landing, we hiked with our gear out to Lake Kontrashibuna, past Tanalian Falls, and to Lake Kontrashibuna. There are no designated sites, but some areas that were clearly used for that purpose. 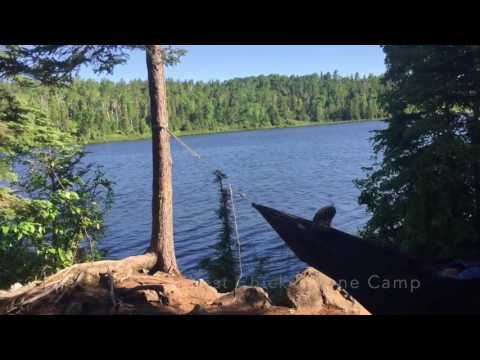 Ours was nestled along the lake, with great views and perfect hammock trees for napping. Our full day at the park was spent climbing Tanalian Mountain. A few miles and 3,800 feet up the trail, you’ll receive sweeping views of both Lake Clark and Lake Kontrashibuna. And, very likely, no people. Like other national parks in Alaska that we encountered, there is often an expensive route and a very affordable route for exploring the park. Wrangell-St. Elias was no exception. While plenty of visitors stayed in the lodge, or in nearby McCarthy, we opted for the free Jumbo Creek Campground, only 1.5 miles from the heart of the park in Kennicott, Alaska. Camping here requires a 1.5 trek to and from your site everyday, but if you can get past that, your time here will be unforgettable. Our site here provided possibly the best view we ever had while camping all across the U.S. last year. At the “campground” -- a flexible term for an array of flat areas around the trail where you can find a place to camp -- is a bear box, and that’s about it. But it’s free, so what can you do? We found the perfect place to pitch our tent, but we cooked a ways down the trail to take every precaution against bears in the area. We didn’t see any during our time here. We also enjoyed hearing about the history of Kennicott from rangers in the many available ranger tours. The shelters at Rock Harbor Campground were especially welcoming to us at the end of our 40-mile trek across Isle Royale in June 2016. We started in Grand Portage, Minnesota, and ferried to Windigo. From there we hiked around 40 miles across the spine of the island, on the Greenstone Ridge Trail, all the way to Rock Harbor. When we arrived, we were happy to see that there were still a few wooden shelters available and we wouldn’t have to pitch our tent the last night before catching the ferry back to Grand Portage in the morning. Isle Royale is one of the most remote and least visited national parks. It was the 51st (of 59) that we visited during our year on the road, and it was not a disappointment. 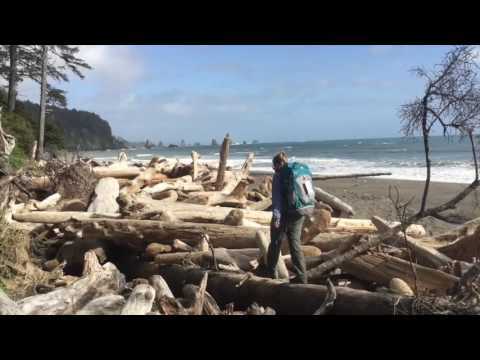 While our long backpacking trek felt like we had accomplished something major, we would also recommend just sticking around the Rock Harbor and completing some of the shorter trails as day hikes. The Rock Harbor Campground was nice: its wooden shelters provided good protection from the rain and a place to spread out after feeling cramped in our tiny backpacking tent for the previous two nights. It also had a picnic table, water and bathrooms nearby. Don’t forget to plan out your trip thoroughly with a ranger ahead of time! We arrived to the Yellowstone area in the evening, and since we had been traveling around the U.S. for almost a year, we were well-versed in finding alternative camping options near national parks. Instead of camping somewhere in the park, we decided to drive through Gallatin National Forest, to the north of the park, until we found a good place to camp. We found a perfect overlook where we pitched our tent and watched the most gorgeous sunset. The best part? No people around for miles and miles. Dispersed camping in the U.S. Forest Service land is almost always a win: the sites are free and remote; there are usually plenty of available spots; and you get a very unique camping experience. Just remember to look up regulations for the specific area you’re looking at, and don’t forget the toilet paper! In Yellowstone, we worked our way from north to south, hitting the highlights. Many of the hiking trails were closed due to bear activity, so we stuck mostly to the close sights: driving through Lamar Valley, viewing Old Faithful & many other geysers, seeing Grand Canyon of the Yellowstone, and spotting wildlife everywhere we went. 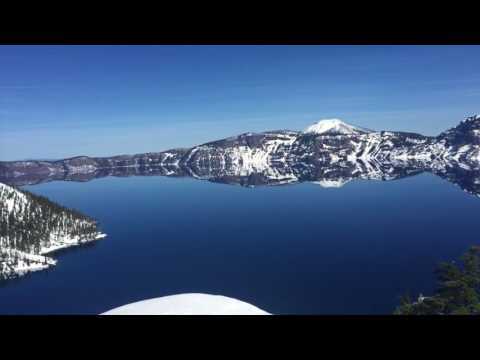 When we visited Crater Lake in April, we knew we'd have to find alternative camping because the park campgrounds would be covered in several feet of snow. We were able to find many options for camping on the way to Crater Lake, before entering the park boundaries. Check the regulations and guidelines before you head out, because there are specific areas where you can pull off and find a place to camp. For us, there were plenty of small unpaved roads where we could find a quiet, flat place for our tent. Crater Lake is one of the areas in the U.S. that receives the most snowfall each year, so their roads are often unplowed until well into the summer season. In the winter and spring, the park offers free snowshoe tours which offer an overview of the park and great views of the lake. Even though much of the park is inaccessible during April, we'd still recommend going if you have the chance. The winter views are incredible, too! 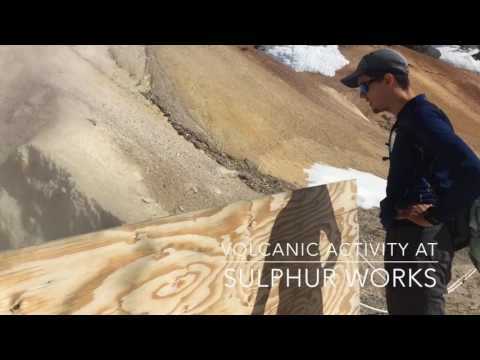 Winter and Spring are harsh at Lassen Volcanic. When we originally planned our year-long trip to all of the national parks, we did our best to avoid the massive snow packs that limit accessibility to the parks. Sometimes, though, this was unavoidable. We found out that when the park is covered in snow, it is possible to park overnight at the visitor center and camp in the snow just adjacent to the lot. Since the park is not the quickest to drive to, we decided this was a good option. We ended up just setting up our small air mattress in the back of our car, but several others were camping on the snow nearby. Use of the visitor center is possible during your stay, including 24-hour access to the vestibule with great indoor restrooms. During our time in Lassen Volcanic, we learned about the park at the visitor center, hiked as far as we could in the snow along the road, and enjoyed a ranger-led snowshoe tour. While Carlsbad Caverns generally serves a one-day visitor, there is much more to see as the sun goes down. Unfortunately, there are no developed campgrounds or lodging inside the park, but the park does offer easy backcountry options for those willing to hike a bit. Permits are required for camping along the Rattlesnake Canyon Trail, but those are easily acquired at the visitor center. As the ranger shakes the dust off the backcountry binder, it’s easy to tell just how few people use this option to camp inside the park. The Rattlesnake Canyon Trail is located along the Walnut Canyon Desert Drive, inside the park, and you are almost guaranteed to be all alone. All you have to do is walk at least a half mile from the trailhead along the trail, then at least 100 feet off the trail, then try not to set up your tent on a prickly pear. This campsite was beautiful, with great views of the desert, and also offered a much different above-ground perspective than the usual visitor receives here at Carlsbad Caverns. To explore the rest of the park, we’d recommend taking the Natural Entrance into the park (winding Switchbacks that lead into the main chamber). If you get too tired to hike out, there is an elevator back up to the Visitor Center! The Big Room is self-guided, but be sure to add on a special ranger tour for access to restricted areas of the park. Big Bend is nothing if not vast and remote, so why shouldn’t your camping experience be the same? We stayed in three sites during our six days in Big Bend: the Chisos developed campground and two primitive drive-up campsites. Primitive drive-up sites in the national parks are the best of many worlds: you can access them by car, so you don’t need to carry everything on your back, they are super remote, and they are cheap. In Big Bend, you will have to snag a backcountry permit for these sites, but that one permit price of $12 can be used for up to 14 consecutive nights. Planning your route around Big Bend before arriving at the park is necessary: the place is HUGE. And you will want to explore all the different areas: the Rio Grande, the Chisos Mountains, and the desert. When we were acquiring our permit, we strategically chose our backcountry sites accordingly. A few things to note about this campsite: there are no facilities, so you’ll have to be prepared with water and toilet paper, and also a trash bag to pack everything out. Also, many of the primitive drive-up sites throughout Big Bend are accessible to all cars, but these along Old Maverick Road are recommended for high-clearance vehicles only. Our high-clearance 2WD crossover handled the roads perfectly. You’ll want close access to the highlights of Big Bend, so don’t be afraid to change campsites once or twice throughout your stay here. 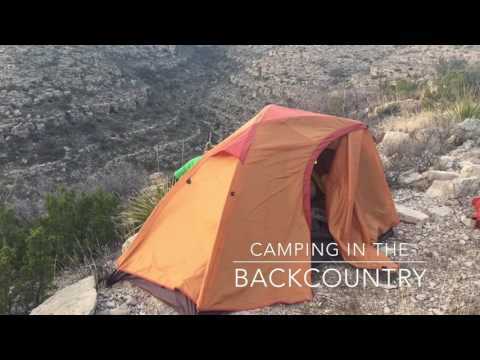 Our highlights included: backpacking in the Chisos Mountains (COLD in February!!) along the South Rim, soaking in the Hot Springs, shuttling across the border to the small Mexican town of Boquillas, and kayaking in Santa Elena Canyon. When we read about the very limited campsites available at Kenai Fjords National Park (only 7 at their developed campground), we wanted to make sure we would have a spot by reserving through a private campground. We chose Miller’s Landing through a coupon we had for buy one night + get one night free. Our stay was okay, but it wasn’t the serene national park experience we’re used to. Sites were very cramped, showers were coin-operated and cold, and people were loud. But its beautiful coastal views and morning coffee made our stay much more enjoyable. We weren’t at the campground for very long each day, and it made for a pretty decent crash pad during our two days in the park and around Seward. In Kenai Fjords, we’d highly recommend the boat tours. We took the 9-hour Northwestern Fjord Tour with Kenai Fjords Tours and loved every minute. The narrated tour was very informative, and we enjoyed going as far into the park as we could get. On our second day, we hiked up to Harding Icefield, a strenuous 8-mile round-trip hike for more incredible views of the glaciers and surrounding beauty. Almost 90% of Glacier Bay visitors never step foot on the land; they simply visit by cruise ship, so being able to camp in this lush and rugged park was a real treat. At the campsites, the trees were dripping with green mosses and vegetation. The provided wooden food caches made us feel secure, and the proximity to the national park could not be beat. We were pleased with how much there was to do at this seemingly empty park: an array of ranger programs, kayak rentals, hiking trails, and great views of the bay from all around. We didn’t attend the Day Cruise from the lodge, but we thought the one-day kayak rental was completely worth the cost. During our day on the water, we saw whales breaching (about a dozen times! 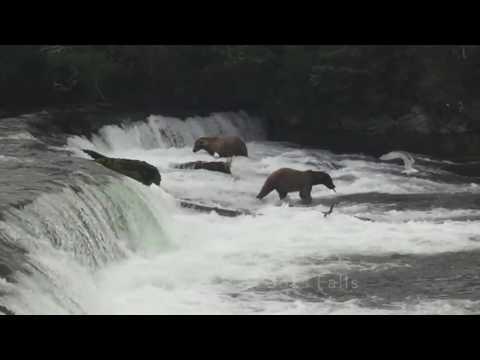 ), sea otters, sea lions, dozens of bald eagles, and brown bears on the coast. We were blown away by the wildlife. Before many of the boat tours and rentals are running for the summer season, having your own watercraft is clutch in Voyageurs. But if you do, the park is practically all yours. We did not have reservations ahead of time, but we’d highly recommend it during the summer season, because we were told they usually fill up. We visited in early summer, before many park events and tours had begun, so we beat most of the crowds. The site we had in the Rainy Lake area, site #R67, was amazing. 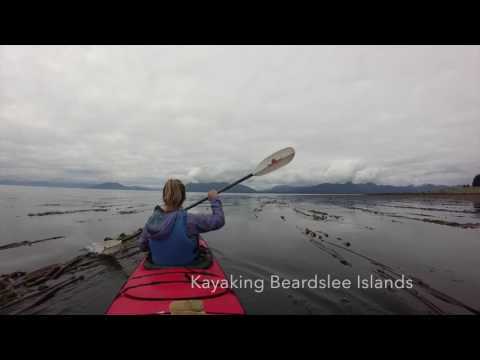 It wasn’t too tough to get out there in our inflatable kayak from the mainland (maybe an hour or so?) and we were able to navigate the islands just fine. Our site had incredible views of both the sunset and sunrise, and since we were on our own small island, it felt truly special. We only stayed here for one night before returning to the mainland to drive south to access Lake Kabetogama and kayak out to our next campsite in Locator Lake. The whole park is beautiful, but we’d recommend not visiting in the off-season if you don’t have your own kayak or boat. The heart of the park is on the water! Cottonwood Campground was a very welcome oasis in the prairies of North Dakota. Along our year-long trip, we slept in a lot of campgrounds, but Cottonwood stands out as just what we needed at the time: quiet, spacious, and beautiful sites, nestled right up along the Missouri river, perfect for taking a dip at the end of a long day of hiking. Cottonwood Campground was a great place to crash for two nights. It was cheap, comfortable, and quiet. It allowed great access to the heart of Theodore Roosevelt National Park. We even ran into a Teddy impersonator at the Visitor Center! 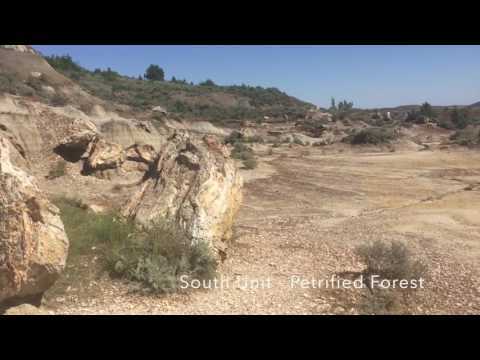 In the south, near Cottonwood Campground, we loved the beautiful scenic drive, the views from Buck Hill, Wind Canyon Overlook, and the Petrified Forest (a bit of a drive around the park). Although most people simply make Wind Cave a one-day or even half-day trip, we decided to stay two nights at Elk Mountain Campground and we are so glad we did. Beyond the Cave tours at the park, there was plenty of hiking and scenic drives around the area to make our time there more fulfilling. The campground itself was cozy. Your basic, national park campground, with standard amenities like a picnic table, flush toilets, and a great evening ranger program about wildlife sounds at night. The biggest thing we learned about this campground is the fact that it has rarely ever filled up, even though people fight for campsites in the Rapid City area during the busy season. Elk Mountain must not be on the tourist radar, which was perfectly fine with us. We really enjoyed this park: we took the Natural Entrance Tour, which offered a great lead-up to entering the cave itself. We also took the Park Loop Scenic Drive and hiked Ranken Ridge, the highest point in the park. 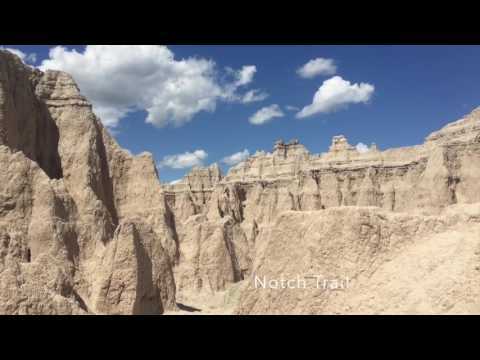 There are two campground options in Badlands -- and several backcountry options -- and Sage Creek was an awesome place to crash our first two nights in the park. We arrived late at night, and without reservations, we didn’t want to risk driving all the way to the developed campground. Sage Creek never really fills up -- and sites aren’t exactly designated, anyway -- so we squeezed our tent in. Camping at Sage Creek is free, but that also means there is no water available here, so be prepared. There are picnic tables and pit toilets. The campground is more of an open field, where you can find a place to pitch your tent or park for the night. We had no trouble finding a place in the busy June season. Sage Creek gave us pretty decent access to some of the highlights throughout the park: along with just driving through the massive badlands, we loved the Notch Trail and the Sheep Mountain Table Overlook hoodoos. We visited Rocky Mountain National Park with friends over Memorial Day Weekend, so we knew we’d need advanced reservations and plenty of space. 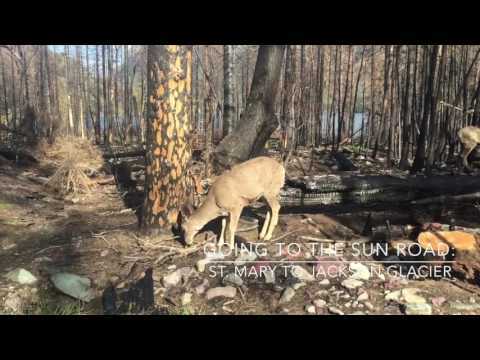 Since there was construction going on at the national park campgrounds and none were available, we found Mary’s Lake to be a great alternative to take our chances at camping in the park. 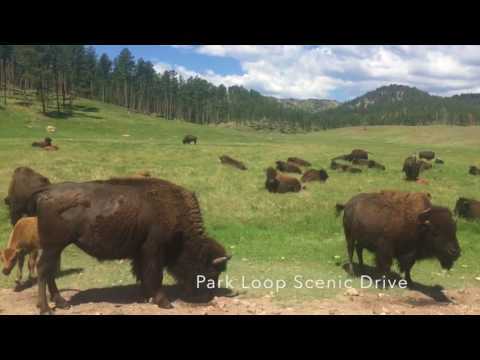 Camping in Estes Park gave us the best of both worlds -- we had access to great restaurants and amenities, but were just a quick drive from the national park. Even though we had reservations, we were able to select our campsites upon arrival. There were two sites located up and away from the rest that were perfect for our group of eight. We felt like we were separated from the other cramped sites, enough to drink and play games around the campfire and not feel like we were bothering other campers. 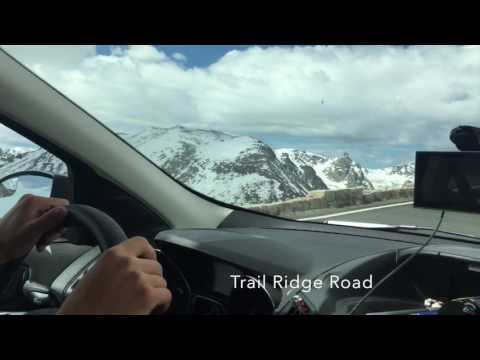 During our time in Rocky Mountain, even though we visited in snowy May, we were able to hike in the Bear Lake area, drive the Trail Ridge Road, and hike in the Wild Basin area to the south. Avoid the hustle and bustle of Jackson Hole with easy access to the Tetons! There were many options for camping in Grand Teton, but our choice was by far the most beautiful and remote. We camped in Bridger-Teton National Forest when we were on our way out of the park, but it would be possible to stay here even while you are hiking and driving your way through the park itself (although you’d add a bit of driving into your day). Dispersed camping is allowed in the National Forest, so as long as you drive out of the National Park and into the National Forest far enough, you can find a place to set up camp. We found a pull-off (on the right side of the road) that led down to a flat, gorgeous site with established fire rings and a perfect place for a tent. There was a road leading down to this spot, but we opted to park up top and hike down because of our limited 2-wheel drive vehicle. It was only a few hundred feet down. Camping in dispersed areas are the perfect way to feel alone, even in popular areas like Grand Teton and Jackson Hole. During our time in the park in May, we still found plenty to do: our highlights included the view from Signal Mountain, early mornings at Schwabacher’s Landing, photos along Mormon Row, hiking to Toggart Lake, and kayaking along Snake River. Spacious sites with a view! We had St. Mary Campground almost to ourselves when we visited in May. We had our pick of sites, and we chose a site that had a great view of the surrounding mountains and valleys. It was the perfect place to serve as a base for a few days of exploring Glacier in the early season. Since the summer season had not yet started, sites were only $10 (They are $23 in the summer), but there were only flush toilets. Remember to store your food properly; we had some foxes around our site that badly wanted our dinner! The Going to the Sun Road was still closed in the middle, but we were able to drive up about 12 miles on each side. St. Mary’s Campground also allowed us easy access to the Many Glacier area. Our favorite springtime Glacier activities included: Hiking to Middle and Lower Quartz Lake (a 12-mile loop), hiking to Avalanche Lake, and kayaking Lake Josephine to Grinnell Glacier. Visiting the Hoh Rainforest during your time in Mount Rainier is a must - and beyond hiking a few trails, a great way to immerse yourself in the rainforest is to sleep in it. The Hoh Campground is a scenic, lush campground that was plenty empty in early May. We had a very pleasant stay here since we were arriving in the area in the evening but not hiking into the Hoh until the next day. Olympic is a huge, spread-out park with plenty of activities to entertain everyone. Even though we visited during the early season, when most mountain activities were inaccessible, we found so many trails to hike and things to do in the low-elevation areas. Some of our favorite activities included: driving up to Hurricane Ridge, hiking to Storm King Mountain, backpacking on the coast to Toleak Point, and hiking the Hall of Mosses Trail in the Hoh Rainforest.